The decision not to stage Senior Challenge Cup annual football tournament was arrived at yesterday, following a three-hour Cecafa Annual General Assembly held in Nairobi. All but one president of the body’s 12 member nations including Kenya, Uganda, Sudan, Somali Rwanda were in attendance. Zambia FA head Kalusha Bwalya graced the gathering as a guest. “Football supporters in the region are very frustrated and disappointed (by this development) but so are we. Cecafa wishes to promise them that we will be back in a bigger and much better way next year,” Cecafa President Leodgar Tenga said Sunday. 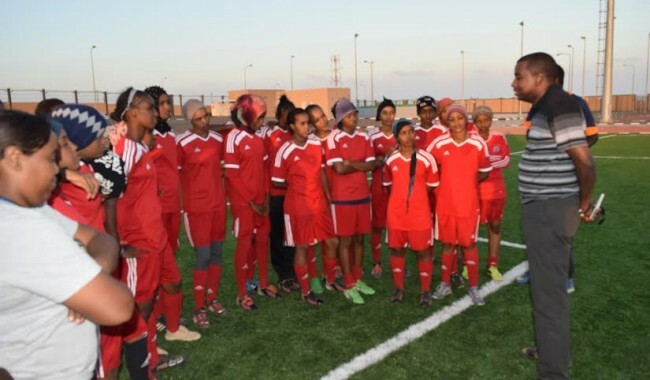 DJIBOUTI FOOTBALL FEDERATION president Souleiman Hassan Waberi has promised bonus for his female youngsters if they make top performance at the upcoming Arab league women’s soccer tournament in Doha. As scheduled the competition will be staged in Doha, Qatar 15-24 February 2015. The visionary president made the announcement as he met with the team at their training base in the Balbala district of Djibouti on Monday. “You are carrying the name of Djibouti and its people on your young shoulders, I know that is not an easy job, but I want to you to show a wonder at the competition and try your best to come back with victory” President Souleiman Hassan Waberi told the youngsters. “On behalf of the Djibouti Football Federation, I promise bonus for you for scoring victory—as you are aware the U 17 boys did well during the recent Arab league soccer competition in Doha, so I would like to tell you that this is your time. President Ismail Omar Guelleh of the republic of Djibouti is aware of what you are doing and he will be happy to see you win the tourney or at least finish second” President Souleiman Hassan Waberi told the young girls. Djibouti’s most experienced female coach Fadumo Moussa Dirie is leading the team and assisted by Ibrahim Hassan Nour, who has so far been victorious in Division C league and now leads the Division B tournament to promote his team to the 1st division, while Ibrahim Hassan Ibrahim is the team’s fitness coach. On her side, Mrs. Dirie who in 2012 became the first horn of African lady to lead a team to CECAFA Club cup believes her young girls were very talent and expects them to perform well at the upcoming Arab league women’s tournament. “Djibouti is under developed country and everything is not as we wanted— I feel there are more things we are missing, but with the encouragement from our president Souleiman Hassan Waberi and his commitment I hope we will be able to do well and the girls are committed to doing their best” Mrs. Dirie told the media.